“That’s how Chávez earned a place in heaven,” said Nicolás Maduro, Venezuela’s president, on a visit to New York last month. Mr Maduro was lauding a programme begun by his predecessor, Hugo Chávez, to supply heating oil to 150,000 low-income families in the United States. Yet such generosity pales next to PetroCaribe, a Venezuelan energy-assistance programme for the Caribbean and Central America that Chávez launched in 2005. Under the PetroCaribe programme, ten members of the Caribbean Community, along with the Dominican Republic, Nicaragua and El Salvador, buy oil from Venezuela. (St Lucia is preparing to receive its first shipment.) How much they pay upfront depends on market prices. The more expensive oil is, the more of the cost is loaned on very lenient terms: in the past, loans have been extended for 25 years at interest rates as low as 1%. The cash saved is earmarked for many purposes: energy subsidies, education, beach clean-ups. Between 2011 and 2013, these deferred payments cost Venezuela an average of $2.3 billion each year in lost income. Similar bilateral deals, most notably with Cuba, add to the bill. That is much less than the $28 billion used for local energy subsidies, but no trifle in a country that is badly short of dollars and basic goods. So far, the desire for influence in the Caribbean has outweighed economic pressures in Venezuela. But there are already signs that PetroCaribe’s terms are becoming more stringent: Guatemala withdrew from the group last year after the terms became less favourable. The possibility that the programme may eventually be wound up prompted a recent report from Scotiabank, a Canadian lender, to call PetroCaribe “more noose than lifeline”. If the trap door were to open, some PetroCaribe countries are far more exposed than others. For Jamaica, Guyana, Nicaragua and Haiti, the value of preferential Venezuelan financing for oil imports is more than 10% of government revenue and equivalent to around 4% of GDP (see chart). Cuba is also heavily dependent. If Venezuela were to start being less generous, some countries would have priority over others. Mr Maduro would doubtless think twice about cutting off his fellow-travellers in Nicaragua and Cuba, for example. But once made, a decision could take effect very quickly. Each PetroCaribe member has a separate energy-co-operation agreement, but the terms are broadly similar. The agreements can be cancelled or modified with just 30 days’ notice, cutting off the flow of new financing and forcing countries to pay market rates. Even with the programme, Caribbean electricity costs are painfully high. In Jamaica the average monthly electricity bill is equivalent to one week’s earnings for those on the minimum wage. 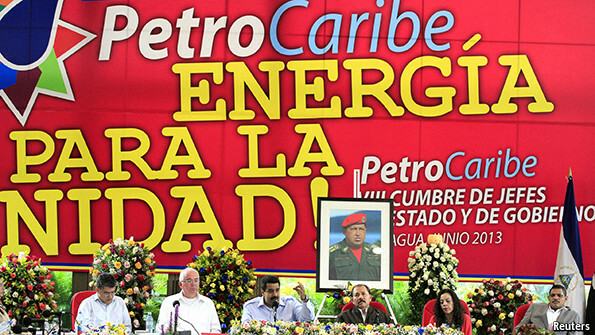 If PetroCaribe is at risk, diversification of energy sources is the obvious answer. Cheap financing has so far blurred the price signals needed to spur new investment. Imported oil remains the dominant energy source in much of the Caribbean: Jamaica spends more on fuel imports than it earns from tourism, for example. On most islands, antiquated generating equipment adds to the problem; so do legally protected power-supply monopolies. There may now be some movement. Jamaica has dithered for years over its energy-investment strategy. But proposals are now circulating for new power plants fuelled by liquefied natural gas (LNG); by ethane or propane made available by America’s shale-gas boom; or by low-sulphur Colombian coal. Within the English-speaking Caribbean, Trinidad and Tobago has gas resources and an LNG plant, which sends some supplies to Puerto Rico and the Dominican Republic. There are long-standing plans to build a gas pipeline from Trinidad to the eastern Caribbean, but pipelines are an expensive fixed asset and don’t sit well with the idea of gas as a “bridge fuel” to the renewables era. Small-scale LNG plants may be the answer.